Merry Christmas, and welcome to Digital Digest! Our scope of coverage will be INCREDIBLY light for these last two weeks of 2011 (simply because there really isn't much in regards for news this week, and there won't be next week), but we'll give it our best as usual. But we do have something new for our blog reviews this week, as we'll begin reviewing some of the complete series sets that we were unable to review in the past for various reasons (though we'll continue to do regular and complete reviews for the sets when the studios send us the releases in a timely fashion). This week, we'll take a look at Shout! 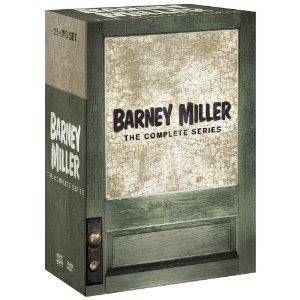 Factory's October release of Barney Miller - The Complete Series. Let's get rolling! Looking for the fifth season of The New Adventures of Old Christine? Warner Archive announced on their Facebook page that they are working on an upcoming release for The New Adventures of Old Christine, but exact details and a release date aren't in the pipeline just yet, aside from the fact that it will indeed be a manufacture-on-demand product. We'll have more on this when we know more. TV Land wrapped up the first season of the Fran Drescher sitcom Happily Divorced a few months ago, but now it is coming to DVD with the release of Happily Divorced - Season One. The two disc set is to be released on March 6 at a $22.99 MSRP. Shout! Factory has been rather quiet on their releases for Simon & Simon for about a year and a half now, but the silence comes to an end in February with their release of Simon & Simon - Season Six. The set will be released February 21 as a Shout! Select exclusive, at a $49.99 MSRP. Tuesday (December 27) is, not surprisingly, one of lightest release dates of the year. The only release of any significance coming on Tuesday is Happiness is Peanuts - Friends Forever. We hope to have a review of this soon in Digital Digest. Note: This is our first Complete Series Review on Digital Digest. We will include these in Digital Digest from time-to-time, roughly once a month or so, to briefly cover complete series that we did not cover in the past. The purpose of these reviews is not to provide a full-fledged review of the set with all of the details that we normally provide in our reviews, but rather to discuss similarities and differences from previous releases, new special features, new packaging, and other details pertaining to the new release. We will continue to feature complete reviews of these sets anytime that we receive review copies from the studios in a timely fashion. Barney Miller had a rough time getting going before it debuted in 1975. At the time, network schedules were flooded with police series, all of them action dramas, so who would want to see a police sitcom? These struggles were demonstrated even further with the failure of the original pilot for the series, The Life and Times of Captain Barney Miller, but ABC went ahead and gave the series a chance anyway, although as a mid-season replacement. Who knew that the series would end up lasting eight years? Similarly, the series had a rough start on DVD. In 2004, the very early days of TV on DVD, Columbia Tristar Home Entertainment (now Sony Pictures Home Entertainment) released the first season, and nothing was heard from them again, until 2008 and 2009 when they released the next two seasons, respectively. But once again, the series became stalled, until October 2011, when Shout! Factory brought it all to a glorious conclusion with their release of Barney Miller - The Complete Series, a 25 disc set containing every episode of the series, and even the first season of the spinoff series, Fish. The set is packaged inside of four Viva-cases (and one slimcase, for the first season of Fish), with each case containing two seasons. The cases are housed inside of a larger (and rather sturdy) cardboard box that is designed to look like the door to the Squad Room Detectives on the front, except the lettering is replaced with the title for the set. On the back of the box, we have a description of the set, along with a "Duty Roster" that lists all of the special features contained on the set. Each of the cases inside has a different cast photo relating to the seasons included in the case. On the back of each case, there is a listing of all of the episodes in the case, along with original airdates. But proceed with caution, because some of these (particularly from the first season) are wrong. You'll find out why a bit later in this review. The back of the case with the Fish episodes gives descriptions of each of the episodes. But if you want descriptions for the main series episodes, don't fret--they are included! There is a very nice episode booklet included with the set that contains descriptions for all of the episodes, as well as a brief history of the series. So, what is the deal with the wrong episode listings for the first season? The menus on the set tell the whole story. As we mentioned, Sony released the first three seasons of the series irregularly over the years, but didn't bother with the final five seasons. When Shout! Factory decided to release the complete series, they had those three releases to work with already. Normally, in such a situation, Shout! Factory would redo such DVDs to go along with their additional seasons that they are releasing, and they did in fact change the artwork on the discs and the packaging for the discs. But it appears, either due to budget issues or time constraints (or perhaps both), Shout! Factory left the first three seasons as they initially appeared on DVD, complete with the original menus, original special features, and original copies of the episodes. When you get to Season Four, you'll notice a marked improvement in the menus. They aren't quite as bland or cheap looking as the first three seasons. The main menu starts with a shot of the New York City skyline, as the theme song begins to play. Then, the menu goes to a shot of the door for the squad room, with opaque windows where you can just barely see people moving inside the squad room. The options on the menu include Play All and Episodes. Selecting Episodes takes you to a menu just like the duty roster with a text list of all of the episodes on the disc. Since the first three seasons are taken directly from the Sony releases, one may immediately remember that Sony included two syndicated episodes, "Ramon" and "The Bureaucrat" on their release of the first season. Shout! does a little bit to relieve one of these problems, with their inclusion of an unedited version of the episode "Ramon" on Disc 3 in the season 8 episodes, but unfortunately, "The Bureaucrat" is still the syndicated version on this set, and there is no remedy for it. Throughout the remainder of the set, every episode pretty much runs at 25 minutes, but there is a slight snag in the seventh season on the episode "Rachel," as the episode runs at a bit over 23 minutes. I'm not sure what, if anything, is missing here, but that is definitely a little short. You'll find virtually every logo that Sony has used from the early 90s up until today on the episodes. There is very little consistency on the logos, so you may find a Sony Pictures International logo on one episode, and the mid 90s Columbia Pictures Television on the next. The quality of the episodes on the set shows some variance throughout. Most of the episodes look decent, but there are some that look very unfocused on the video quality and there are some defects on some of the episodes. The mono audio is perfectly adequate throughout. The final episode of the series actually has a disclaimer stating that it was the "best possible copy" that they could find, but honestly, I didn't think that it looked any worse than some of the other episodes on the set. The set includes some new special features that were created exclusively for this set, but you won't find them until you get to Disc 3 of the eighth season. First, we have a commentary on the final three-part episode, "Landmark," with Tony Sheehan, Jeff Stein, and Frank Dungan. All of them participate on all three parts of the episode. You'll find much more on this disc, though. First, we have "Inside the 12th Precinct" (29:18) where we see interviews with Hal Linden, Abe Vigoda, Max Gail, and even recent (before his death) interviews with Steve Landesberg. "Salute to the Old One Two" (24:07) is a similar featurette, except this one focuses primarily on the set that was used for the series. "Inside the Writers Room" (16:29) is an interview about the writing of the series, with writers Jeff Stein and Frank Dungan. But what I found to be the most interesting special feature is "The Life and Times of Captain Barney Miller" (26:44), which was the original pilot for the series. It has a much different feel from the series that eventually evolved, with a mostly different cast (although Hal Linden and Abe Vigoda are in the original pilot) and different format. In this episode, the first half of the episode follows Barney's day at work, while the second half follows his life at home. You can even compare this episode to the unedited version of the episode "Ramon" (25:10), which as previously mentioned, appears on this disc. Finally, we have "You Don't Know Jack: Excerpt from the Jack Soo Documentary" (7:39). This is just an excerpt from a full-length documentary that was produced about Soo. As for the special features that were carried over from the previous releases, the first season still contains the rather scant text biographies of the cast members, and the second season still contains the Minisodes from The Facts of Life and Charlie's Angels. These aren't particularly worth viewing, but they are there. All in all, this is a great set and well-worth the cost at the MSRP, but considering you can find it much cheaper than the MSRP at most places, it becomes an excellent deal. Since this is the only place you can find seasons 4-8 at the present time, it is a no-brainer that you should pick up this set if you don't already own the series, and even if you own the first three seasons, you'll want to upgrade to this set. It is unfortunate that they did not redo the first three seasons on this set to match the remaining seasons, but it isn't a major disaster, if you don't mind a few edited episode slipups (though some people certainly are bothered by such issues). Seasons 4-8 are not available individually at this time. TV Tango (www.tvtango.com) - If you are a regular reader of our blog, you'll recognize this website as one that we often refer to, but you may not have necessarily clicked on it since we often summarize what we are interested in and refer you to check out the site for further information. In fact, we referred to this website just yesterday in discussing what is coming up for special marathons this holiday weekend. But since the website does have information on special marathons this weekend, we thought we'd also try to introduce you to the rest of the website and everything else that it has to offer for our Click of the Week this week. The site proclaims to be the "ultimate TV database," and on the main page, you can type in any TV series that you are interested in and find information about it from all of the major TV websites, as well as TV Tango's own database. But there is so much more to the site than just the database. There is a TV Listings page where you can find out what is on tonight and tomorrow night on the major networks, but what is even more fascinating is the ability to go back in time and see what aired on, for example, the day that you were BORN, assuming you were born after 1950. Some dates even have episode titles listed. There is also a very nice blog on the site that you should check out that is updated a few times a week with interviews and other nice features. It isn't really a news blog, but rather a blog with unique features. There are other features on this website as well that make this site definitely worth checking out this holiday weekend. That's all for this Christmas weekend. Until next time, keep it digital!